The NFL has done plenty of tinkering with kickoffs in recent years. In 2011, the league moved them up from the 30-yard line to the 35, making touchbacks much more common. This season, touchbacks were brought out to the 25-yard line instead of the 20. Most of the changes have been met with plenty of criticism as kickoffs are on their way out of the NFL altogether, but John Harbaugh and Justin Tucker are advocating a way to save them: one point for kicking it through the uprights on kickoffs. The reason Harbaugh brought up the point is because Tucker drilled one through the uprights on a kickoff Sunday, which is an impressive boot to say the least. That rule change certainly would be interesting, particularly late in games with the score close. Kickers would be putting everything they’ve got into kickoffs attempting to net their teams one point – as little as that might seem. Harbaugh (half-heartedly) believes it’d be a good adjustment to the dying kickoffs, and Tucker obviously agrees. “If we’re going to keep making the game harder for kickers, you gotta reward us in some way,” Tucker said. “The ownership, the Competition Committee, the NFL, they’re great at this give-take thing when (CBA) time comes around, maybe we can throw that one out there. 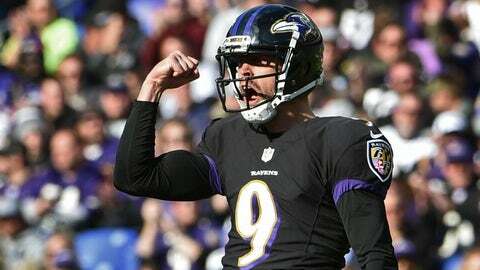 Tucker has been the Ravens’ MVP this season, making 15 of 15 extra points and 27 of 27 field goals. He’s the only kicker in the NFL to make every single one of his kicks, which is an incredible feat. On Sunday, he drilled three 50-yard field goals, making them from 52, 54 and 57 yards out – all before halftime. Now just imagine how many points he’d have if he were rewarded an extra one for making field goals on kickoffs.